New tires are a big ticket item for most drivers. You’re not only concerned about the price, but you want to know that it’ll be a long time before you need to buy new tires again. There is also the safety aspect to be concerned about as well. 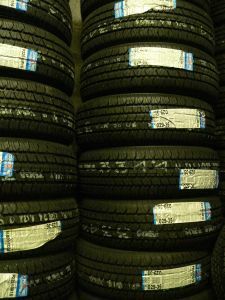 Tires do a lot of work – they carry the weight of the vehicle, you and your passengers around. They need to be up to the task. So don’t buy into the myth of cheap tires doing a good job. You want to be sure that the tires you choose hold the road and provide good traction. Drivers who carry heavy loads or tow a trailer need high load tires to be up for the job. At Express Car Care, we think it’s important that drivers understand the effect of price on a tire’s performance and durability. Every major tire brand sold has what’s known as Tier 1 tires. These tires are well-engineered and very high quality. Comparable tires are usually in the same price range from brand to brand. Stepping down in price you come to Private Label tires. Some large tire store chains carry tires with the chain’s own brand. It’s important to know that most private label tires sold in the area are built by the same Tier 1 brands – so they are a quality product. The lowest priced tires on the market are Tier 3 tires. These tend to be imported from other countries and don’t always have the same strict quality standards that Tier 1 and Private Label tires have for them. Since you get what you pay for, you can’t expect a Tier 3 tire to deliver the same performance and durability as the others. But sometimes the budget only allows for a Tier 3 tire, that’s alright, because it’s safer to be driving on new tires rather than pushing your old tires beyond their limits. But it’s good counsel to buy as much tire as you can afford, because it will be much less expensive in the long run. Your tires are the only part of your vehicle that touch the road. You’re only as safe as your tires are well built. Cheap tires are a myth. Buy value – not price.